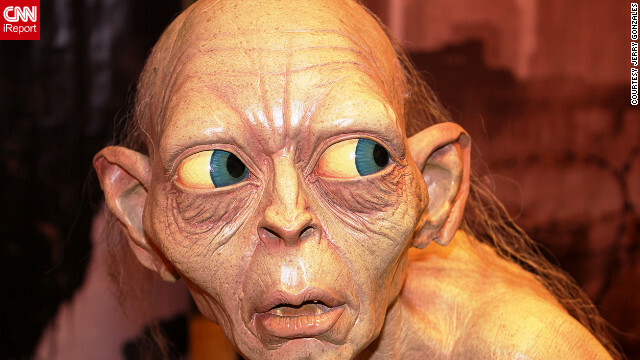 The visage of Gollum greets you at New Zealand's Weta Cave gift shop. If you ever want to know the difference between a casual fan and a full-on geek, here's a great example (and we've chronicled oh, so many here on CNN Geek Out's Squee). As anyone familiar with J.R.R. Tolkien's Middle Earth will tell you, there are a lot of complex relationships involved within this universe. Tolkien dedicated stacks of pages chronicling his characters' lineage. According to nerd proselytizer Chris Hardwick, one thing nerds love to do is obsessively catalog. A perfect embodiment of this notion is now available online, through Emil Johansson of Gothenburg, Sweden's latest project - an interactive family tree of "Lord of the Rings" characters. If you want to know how Feanor relates to Celebrimbor, or just want to know your elves from your hobbits and dwarves, this impressively large document can be a helpful resource. It's probably also a great way to pass the time while waiting for the new "Hobbit" movie and should make collecting the upcoming Lego set easier, as well. CNN Geek Out: What inspired this interactive? Johansson: I read the "Lord of the Rings" when I was 11 years old, just before the first (Peter Jackson) movie, and I can honestly say I didn't fully grasp the complexity of the books at that point. I dove into the world of "Silmarillion" about a year later and immersed myself into Tolkien's world completely. I was a child with a thriving imagination and I think the project was a result of wanting to have something to do when imagining stories around the different characters. CNN Geek Out: How often do you go back to Tolkien's work? Johansson: After I had read the books at age 11 I wanted to read everything there was to read about Middle Earth and there was a time when you'd probably call me obsessed. Now, 10 years later, I reread the books at least once a year. CNN Geek Out: How long has this process been going? Johansson: I started on the family tree probably six years ago and finished a paper version. I always wanted to put it on the Web but never knew how until now. I started on the online version in November last year and since there are no complete open source code for doing these kind of things I had to program much of it myself. CNN Geek Out: What kind of reaction have you received so far? Johansson: I've had a lot of positive response to the project and received a huge amount of e-mails. There are naturally people who contact me with corrections and suggestions. If there is something I have learned it is that Middle Earth genealogy is complex. Tolkien changed his mind frequently when writing the books. Christopher Tolkien later published books based on his father's early notes, which has created some debate concerning what can be considered true to Tolkien's original intentions. CNN Geek Out: What has been the most difficult part of the process? Johansson: Until now, the programming. I am a student in chemical engineering and know very little of programming, so I've had to learn much of it by "Googling." I think what will require most of my time now is correcting mistakes. I have very gladly accepted the help of Shaun Gunner from the Tolkien Society for proof-reading and advising on future updates to the site. CNN Geek Out: What is it about Middle Earth that has had such a lasting effect on fans, and inspires them to dive so deeply into its history? Johansson: I think it is because the world is so beautifully well-crafted. Every single time you read one of the books you find something new. It is a whole world with enough information to make it seem real and vivid but also enough mysteries to allow peoples' imagination to run freely. That perfect balance along with Tolkien's passion and attention to detail is what makes his work a masterpiece. Geek Out wants to know: What beloved fan franchise would you like to see cataloged in such a way? Let us know in the comments. You are truly a good webmaster. The website loading pace is incredible. It seems that you are doing any unique trick. Moreover, The contents are masterpiece. you have done a excellent activity in this topic! Hello there, You have performed a fantastic job. I'll definitely digg it and personally recommend to my friends. I'm sure they will be benefited from this web site. A person essentially lend a hand to make critically posts I would state. That is the first time I frequented your web page and to this point? I amazed with the research you made to create this actual put up extraordinary. Great job! This really isn't that impressive. The paperback copy of Return of the King that I bought in the 90's has a family tree in it. I don't know if that was Tolkien's inclusion or not, but the guy in this article is about 20 years too late. I did my undergrad thesis on the Silmarillion... this would've come in handy for me about 8 years ago! This is an interesting project and should shed some light on inconsistencies that arose over the long career of Tolkien's writing, compounded further by his son's efforts to complete his father's life's work. There actually is open source code for it. Look up PHPGEDView – it works pretty well. "All we have to decide is what to do with the time that is given to us" – Gandalf. What, as opposed to those people who spend their free time gaming, tweeting, texting, watching NASCAR and such-like? I don't see all the dwarves who were Thorin's companions on the quest to the Lonely Mountain. It looks to me like Dori, Nori, Ori, Bifur, Bofur, and Bombur. Or does this tree not cover the characters from the Hobbit as well? Sorry – I meant to say "tt looks to me like Dori, Nori, Ori, Bifur, Bofur, and Bombur" ARE MISSING. Well, send the guy an email. The project clearly says "BETA". Bifur, Bofur and Bombur are related to each other, but not the dwarves in Hurin's House. Dori, Ori and Nori are of Durin's folk but are unspecified 'distant relatives' of Thorin II. Already done, by Tolkein himself. But never published in a single integrated form. There is an extensive tree in the Simarillion and my copy of Lord of The Rings. I think its cool a fan took the time to do this, but it isn't that revolutionary. The LOTR contains geneological tables for the Hobbits and later members of the House of Durin. The Silmarillion contains tables for the Eldar and Edain in the First Age. I can't remember seeing anyone compile tables for the House of Eorl or the Numenorean Realms in Exile (Arnor and Gondor). I'm confused...Sam is Pippin and Merry's father? Nevermind, those are just what he named his kids after. Posted on Your are not worthless. You mean the world to smnooee. You just need to find out who. And don't ever try to take your life ever you are loved by more people than you think. like him i obsessed with this world at one time when i was young. so much so that i started my own language, calendar and tried to create my own monsters. then i discovered dungeons and dragons. a rip off to be sure but worth considering. i have been playing rpgs ever since. i thank tolkien for his talents and even for his old fashioned sense about women and warfare. still there comes a time when you must grow up and put away childish things. i just find it hilarious that the stuff people used to tease us about and call us nerds for liking is so mainstream today. anyway, the grey havens are calling and time for me to board my ship before melkor is released one last time from his prison and destroys the world. I started on my fantasy route by an unusual route. Spock. Well, really Leonard Nimoy. "The two sides of Mr. Spock" a very nice album (vinyl). He had a song called 'Bilbo Baggins', lively and humorous, and somehow I found out where the reference came from. I got the original paperback set and my parents read them as well. This did go on to branch out to D&D as well as the Pern series, though that may have been influenced by my years of reading Andre Norton and the YA books of Heinlein. Doesn't matter. It takes amazing knowledge and creativity to develop an entire world, whether Middle Earth, Pern, or 'Stranger in a Strange Land'. Having just finished the LOTR, again, I was thinking of compiling a family tree for the house of Eorl. Not now. Compiling a geneological table to this extent is a big job. Well done Emil! Hey everybody: quit saying the wizards are Istari and not Maiar. ISTARI ARE MAIAR. They are a group of Maiar who agreed to go on a mission to Middle-earth and live and work under certain conditions (appear in old man's body, limits on powers and so on). They had other names back in Valinor. Gandalf's origiinal Maia name is Olórin. Also, it's MAIA = singular and MAIAR = plural. Isn't it amazing how Tolkein created such in-depth histories for the different races/cities of Middle-Earth? Hard to believe he came out with The Hobbit and LOTR over half a century ago. Your statement concerning Gollum's origin rings truer than the Liberty Bell did long ago. And you were found as a newborn abandoned in a toilet. Hey, isn't that a pic of my ex-husband? great taste you have. how did you feel waking up to that every morning? Nope! That's your brother-in-law, Jake. The wizards are of the Istari and not the Maia and there are a few characters missing. Someone did not crack open Unfinished Tales. No, they're Maia. They may have been known as the Istari, but they're still Maia. Someone needs to check Wikipedia. Istari – The Maiar who were sent from Aman to in the Third Age to resist Sauron...Translated "Wizards." Nerd know-it-alls. If you are going to nitpick, make sure you've read the source you say you're citing. ...and someone needs to pay more attention before correcting other people. Istari are Maia. Indeed they are. Hence the quote from Gandalf: "Olórin I was in my youth in the West that is forgotten" The ONLY thing we know about all the Istari are their names as Maia. Denim, LOL that would be extensive! But to get you started here is a chart of the relationships between characters in the X-men comics. Somebody spent alot of time on this!